EPA Administrator Scott Pruitt sat for a routine Senate Environment and Public Works (EPW) Committee hearing today and Senate Democrats tried to make it as painful as possible for him. Pruitt has a history of equivocation on climate, and has made it his mission to grind the EPA down to a halt, which is exactly what Senate Democrats pressed him on. WATCH: Miles meets scientists that are safeguarding government climate data. The Republican senators praised Pruitt’s rollbacks of environmental regulations, which they say have improved the economy. Both Republicans and Democrats spent a lot of time prodding Pruitt on specific projects, especially trying to clarify when backlogged comments would be answered or Superfund sites would be cleaned up. Perhaps the only thing the different sides of the aisle agreed upon was their excitement at Pruitt’s push to eradicate lead in the country’s drinking water within a decade–with only Sen. Tammy Duckworth (D-IL) questioning the two-year-long delay in the EPA’s review of the federal Lead and Copper Rule. WATCH: Miles reports on the dangers of the lead crisis in America. Pruitt answered that line of questioning in the manner he answered almost all of the attacks today–saying, unfazed, that his agency is currently reviewing that project without offering any specific details. There were so many rollbacks and issues the Democrats wanted to discuss that it took a Republican, Sen. Mike Rounds (R-SD), to bring up one of the biggest recent debacles Pruitt has been involved in. 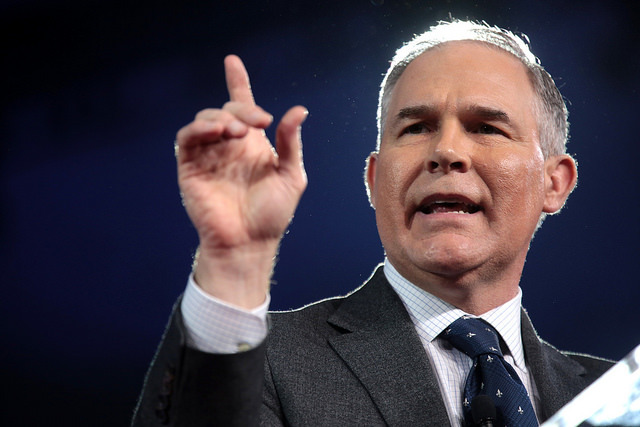 Rounds asked Pruitt to clarify why he chose to disallow EPA advisory board members from receiving EPA research grants, a move that has garnered him a lawsuit filed by the Union of Concerned Scientists. “That is something from my perspective that is not consistent with providing independence,” said Pruitt, before quickly moving on to a question about advanced biofuel projects. WATCH: Miles meets the first casualties of Pruitt’s purge of advisory board scientists. A recent Environmental Defense Fund (EDF) report that Pruitt was likely personally involved in the removal of climate change information from the EPA website was not mentioned during the meeting. Speaking of President Trump, Pruitt was not asked about the President’s comments about climate change during his interview with Piers Morgan. President Trump had said: “There is cooling and there is heating,” yet global averages have been steadily climbing for decades now. “The ice caps were going to melt, they were going to be gone by now, but now they’re setting records,” said the President. Here, he is right, they’re setting records–record lows, in both the Arctic and Antarctic. Instead, Pruitt was asked about another bit of Trump-related news: a report making the rounds today that Pruitt had in 2016 blasted then-candidate Trump on a radio talk show, agreeing that he was “dangerous” and would be “more abusive” of the Constitution than President Obama. “Do you recall saying that?” asked Sen. Sheldon Whitehouse (D-RI).